Explore a map of the vast Middle East, featuring cities from Rabat to Islamabad, Ankara to Khartoum. For each country, the map features information on the capital, year of independence, and political structure. Get an inside look at life in Bolivia with our Photo Essay. 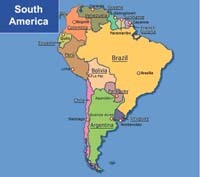 Learn about the history and politics of South America. During Slobodan Milosevic's years in power, wars raged in Yugoslavia that eventually led to its disintegration. This photo essay depicts Milosevic's battle with Yugoslavia's independent news media.